This scenery? That's the bulk of what you'll see while trying to survive in Gods Will Be Watching. The premise is simple: you've got 40 days until you can be rescued. You have a crew, which you have to feed and keep sane. You have a radio, which you'll want to fix. Naturally, as you play, other things come up too—I won't spoil those. Whatever it is that you have to deal with, you only get five actions every day, and these can be used on tasks like making a fire, repairing, talking to your crew, hunting, if not murder. Oh, and you can pet a cute puppy, too. That's important. The premise is simple, but the solution (make no mistake, this is kind of a puzzle) is not. I think I got about a dozen days in before a good number of my crew went mad; I was too busy trying to repair the radio at all costs to be able to tend to their mental state. Guess I'd make an awful leader, but I will say that my puppy didn't die. Maybe you can do better than I did? 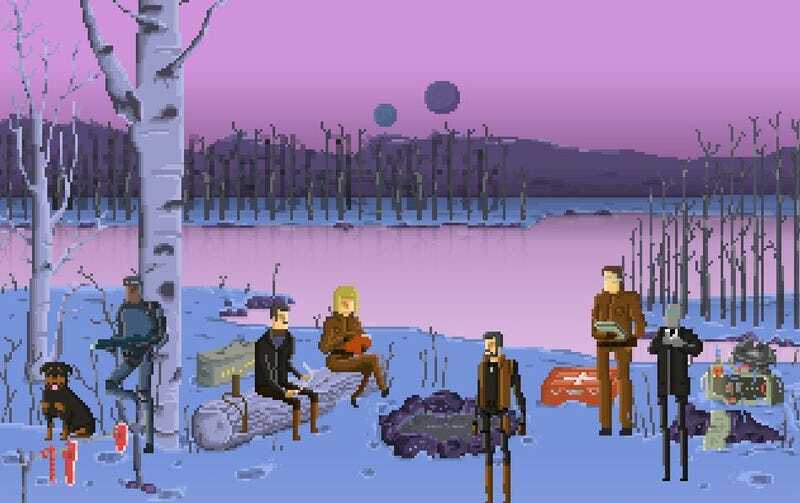 Gods Will Be Watching was created as a part of Ludum Dare 26, an online game jam in which developers make a game over a weekend. The latest theme, though not chosen by Kanye West's Twitter feed, was "minimalism"—that's why this game takes place on a single screen.